This week has been incredibly busy, but in a really lovely sociable way! Earlier in the week when the weather was nicer Joss and I made a half dozen trips to the park in two days! She’s discovered the joys of football (almost) whilst she enjoys carrying a ball there is a definite sense in which she would rather the ball did not get dirty in the park thank you very much, and consequently we have more photos where the ball is being toted about than kicked. Then mid-week saw the turn of my 30th Birthday, a good few meals out and plenty of treats along the way, I haven’t given too much of a thought to what this milestone means yet, perhaps that’s a good thing, avoiding a midlife crisis by being an ostrich?! I’ve really pushed myself to blog everyday, sometimes twice a day this week. My favourite post was the hardest by far, a tutorial. Making this little fabric picture was lovely, but I lost track with photography a little along the way so I’ve learned that it’s important to split the work up into small tasks photographing as you go, it was a good experience and has had positive feedback so far! Something I wanted to mention and perhaps pick other’s brains about is the random popularity of posts. This Tagxedo tutorial I did last year gets a lot of traffic. I realised that search engine traffic was driving this interest, but was uncertain about why this was the case as the software package offers its own ‘how to.’ It was then that I spotted something, a happy accident that I had spelled the software wrongly on my original post, a common spelling mistake has been driving this traffic! I don’t really know what to do with this info beyond more frequent misspelling, but I guess it’s made me think about the importance of blog post titles?! I’ve saved a few things to re-read this weekend, one thing I want to explore more is Pinterest, so this Reading Residence post looks invaluable! I spotted some great ideas on this list from Snowing Indoors, 50 prompts to beat the bloggers block, and there are some total blogger gems of tools here with this blogging crash course that I must return to read some more of! And one last thing, a plan! 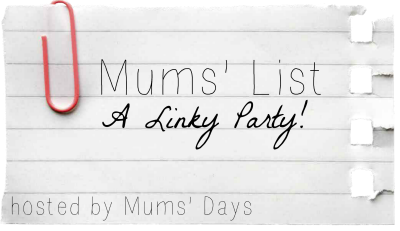 This week I plan to make a list of the linkies I join, including this one to keep myself right! I wish I was remotely craft-capable; that picture is lush! I’m dreading the day Gwenn wants to start making stuff, but at least I can refer to your blog!! Thanks for the great articles you’ve pointed to, I shall be putting them on the reading list for next week. Interesting about the mis-spelled term and how that created a lot of traffic. That may be something to keep in mind when creating tags, to tag the post with a correct spelling and to also tag it with an extremely common mis-spelled version of a unique word. Also, I love all of the pictures in your post, they are fun and entertaining. I admire them and want to increase the number of images in my posts, too. You’re an inspiration! Happy Birthday! Love the photo of Joss in the park with her ball. I also love your tagxedo, I must learn how to do that.